You know how when you start looking at things through a certain lens everything seems connected? We're having one of those moments lately. An article in today's Orlando Sentinel highlights exactly the kind of company that provides the cornerstone of a creative village. And exactly the kind of company we should be throwing our arms around as a community. Except I'll bet you - like me - hadn't even heard of them before this article. We should be working to create an environment where companies like this can grow and thrive. Wonder if we've asked them what would help them be more successful here? Certainly, Blue Orb seems to be doing just fine. But how much more might be achieved if the company were surrounded by other similar companies in a collaborative environment that meets the social, housing, education and entertainment interests of its workforce? I'm not saying Maitland isn't that place ... wait, yes I am. Maitland isn't that place. Right now, it's mostly just a great idea. 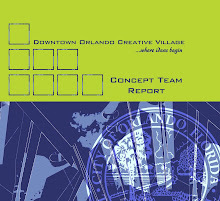 The creative village concept for Orlando originated with Mayor Buddy Dyer, who recognizes the need to continue to grow our creative community such that economic development opportunities might be generated. Specifically, it refers to the 50+ acre site around the current arena downtown. More poetically, it is referred to as "the shining city on the hill" in a concept report developed by a community task force and published earlier this year by the City of Orlando.